Greetings, Delivered Ones! 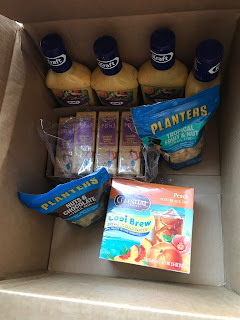 Today's Prime Pantry box contains Kraft Honey Mustard dressing, Celestial Seasonings Cool Brew iced tea, Keebler PB&J Crackers, and two bags of Planters Trail Mix in Tropical and Chocolate. I know that I often sing the praises of Ken's Honey Mustard dressing, but the Kraft dressing was on sale for $1.99 per bottle, and it works just fine. This is a case where it's a push between the favorite item and the lower cost item, so the lower cost item wins out. I love Gold Peak tea, but it generally costs between $2 and $2.50 for 52 ounces. I saved one of the bottles once it was empty, rinsed it out, and now make my own using tea bags at a fraction of the cost of a single bottle of Gold Peak. I love to try different trail mixes. Planters had some good options available this time. The PB&J crackers are okay. I honestly think I prefer just plain peanut butter crackers. But for $1.19 a box, these were a good deal. Now for the survey and GPT site thoughts. I finished filling out all of my profile surveys for Mindfield Online. On the positive side, Mindfield does offer up plenty of surveys. On the negative side, they are hard to qualify for (at least for me) and you don't get paid for the ones you don't qualify for. I spent an hour trying to qualify before throwing in the towel for the day. My son and I started a subscription to Pretty Litter via Swagbucks. I got 1200 Swagbucks for this subscription. Don't forget to check Swagbucks before shopping online. I've been very busy today. I feel like I need to have a rest now before heading to the store to pick up some necessary items such as potatoes.